So Many Stamps So Little Time: Sale-A-Bration Is Here! I added lines of machine stitching to tie my flags together. Super simple! I finished my card with a simple stamped sentiment from the stamp set So Very Grateful. If you would like me to be your demonstrator here is my ordering website. Remember, for every $50 you spend you will be able to pick one of 13 SAB items available including stamp sets, a punch, kits, and digital kits! Something for everyone. 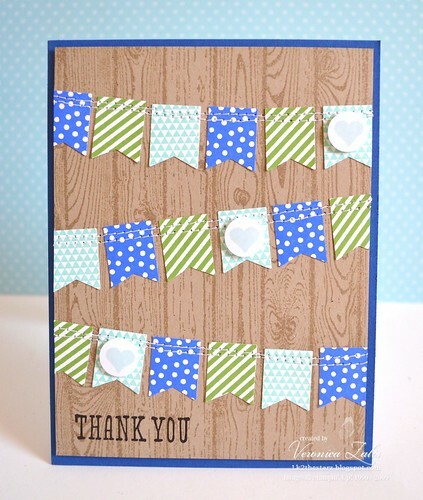 wow love all the flags and your stitching is perfect.. love this card..
Holiday Inspirations Valentine Inspired Blog Hop! Flashback Friday - Love Ya Bunches! Papertrey Ink Make It Monday - Congratulations! A Preview And A Challenge!